Objective Identify the factors associated with the age-standardised breast cancer mortality rate in the municipalities of State of São Paulo (SSP), Brazil, in the period from 2006 to 2012. Design Ecological study of the breast cancer mortality rate standardised by age, as the dependent variable, having each of the 645 municipalities in the SSP as the unit of analysis. Settings The female resident population aged 15 years or older, by age group and municipality, in 2009 (mid-term), obtained from public dataset (Informatics Department of the Unified Health System). Participants Women 15 years or older who died of breast cancer in the SSP were selected for the calculation of the breast cancer mortality rate, according to the municipality and age group, from 2006 to 2012. Main outcome measures Mortality rates for each municipality calculated by the direct standardisation method, using the age structure of the population of SSP in 2009 as the standard. Results In the final linear regression model, breast cancer mortality, in the municipal level, was directly associated with rates of nulliparity (p<0.0001), mammography (p<0.0001) and private healthcare (p=0.006). Conclusions The findings that mammography ratio was associated, in the municipal level, with increased mortality add to the evidence of a probable overestimation of benefits and underestimation of risks associated with this form of screening. The same paradoxical trend of increased mortality with screening was found in recent individual-level studies, indicating the need to expand informed choice for patients, primary prevention actions and individualised screening. Additional studies should be conducted to explore if there is a causality link in this association. This study used secondary data on breast cancer mortality and the associated covariates. The mortality information system used to obtain the breast cancer mortality data contains a near-complete record of deaths nationally (with comprehensive records for the State of São Paulo) and is extensive in its coverage, with only a small proportion of deaths without defined cause. The use of an ecological design is not aimed to assess causal relationships; however, it can be useful for raising hypothesis. Ecological study design can also be considered one of the strengths of this research because it allows for elucidation of invisible effects on the individual level, as overdiagnosis and overtreatment are better studied in populations, owing to the difficulties of individual-level estimation. The findings of this research in the aggregated level are in agreement with local recent studies with individual-level designs, also showing a positive association between mammography and breast cancer mortality. In order to generate hypothesis about potential causal factors related to breast cancer mortality, the aim of this study was to identify factors associated with the age-standardised breast cancer mortality rate (per 100 000 women-years) in the municipalities of São Paulo State, Brazil, from 2006 to 2012, through an ecological approach and making use of public access secondary databases. After each of the covariates was standardised, an exploratory analysis with the standardised covariates was performed, to evaluate the presence of outliers using dot plot charts. Based on these analyses, one extreme, but correct value, was detected in the variable V_68 (per capita gross domestic product, in millions of Brazilian reais), and this problem was corrected by transformation of the variable using the square root. The collinearity between the covariates was analysed by the variance inflation factors (VIFs) calculation. We iteratively eliminated the covariate with higher VIF, until a model with VIFs lower than 3.00 was reached.14 Among the covariates listed in table 1, the following were selected for modelling: V_15, V_16, V_17, V_25, V_26, V_27, V_30, V_31, V_41, V_42, V_46, V_53, V_66, V_RZ_68, V_69, V_70 and V_72. The mortality rate was modelled using multiple linear regression. For the selection of the model with the best fit, the stepwise algorithm with reverse direction was applied, and the Akaike information criterion (AIC) was used as the adjustment criterion.15 The homogeneity of the residuals was evaluated using the spread-level plot and Breusch-Pagan test. The spatial autocorrelation of the final model residuals was evaluated by the Moran's I test,16 using a neighbourhood matrix by contiguity. Residuals were also used to create scatter plot charts with predicted values, and each of the covariates (both those of the final model and those excluded), to rule out the presence of systematic patterns. The breast cancer mortality rates among women aged 15 years old and over, standardised by age, for all municipalities in the State of São Paulo are shown in figure 1. The mortality rates reveal wide variation, ranging from 0 to 431.8 deaths per 100 000 women-years. 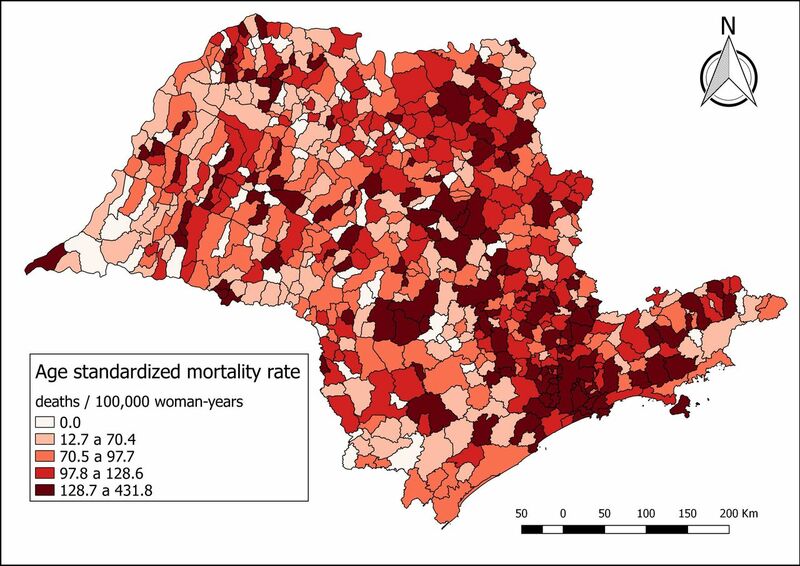 Map of breast cancer mortality rates (per 100 000 women-years) in women 15 years and older, standardised by age, in the municipalities of São Paulo State, Brazil, in the period from 2006 to 2012. The multiple linear regression modelling showed that the model with covariates ‘Gini Index’, ‘Mammography ratio’, ‘Percentage of women with private healthcare’ and ‘Proportion of women of childbearing age who did not have children’ produced the lowest value of AIC (6988.6). We named it as model I. 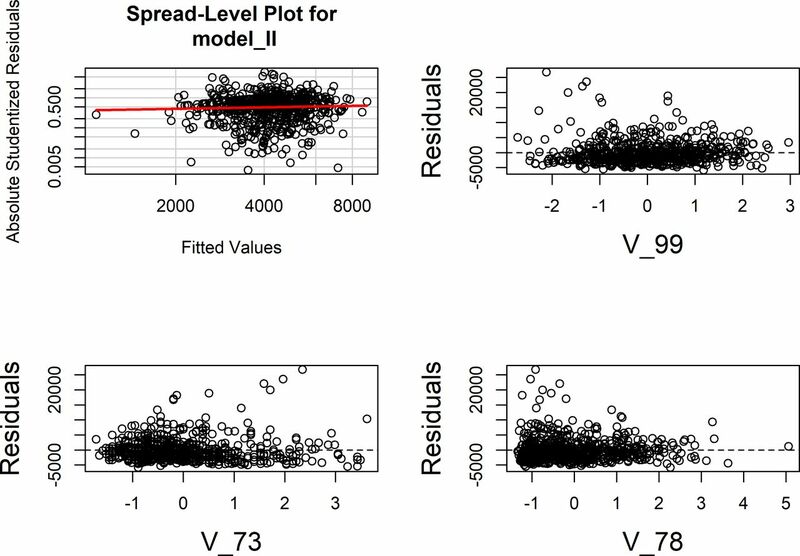 We performed the spread-level plot and Breusch-Pagan test to evaluate the homogeneity of variance of the residuals of model I and both suggested heteroscedasticity. The p value of Breusch-Pagan test for model I was 0.0001. This analysis allowed us to identify three extreme residuals and the necessity to transform the outcome. Then, we removed three municipalities that were responsible for the extreme residuals and transformed the outcome by a power of 1.8 to stabilise the spread. Doing this, both spread-level plot and Breusch-Pagan test indicated homogeneity of variance. The AIC of this new model was 12449.8. To evaluate if this new model was still that with the lowest AIC, the stepwise algorithm with reverse direction was applied again. After that and maintaining the removal of the extreme residuals and the same transformation of the outcome, we obtained the final model (model II) compounded by the covariates ‘Mammography ratio’, ‘Percentage of women with private healthcare’ and ‘Proportion of women of childbearing age who did not have children’. All these covariates had a directed association with the mortality rate (table 2). The R² of this model was 8%, and the AIC was equal to 12447.8. The spread-level plot of this model is presented in figure 2 and the Breusch-Pagan test had a p value of 0.3608. Spread-level plot for the final model (model II) and the scatter plots of residuals versus the covariates that entered into the final model: V_99 (Proportion of women in childbearing age who did not have children), V_73 (Mammography ratio) and V_78 (Percentage of women with private healthcare). Table 2 presents the standardised covariates, according to the decreasing values of their regression coefficients (betas), that is, ordered from the highest to the lowest degree of influence on the mortality rate. The covariate ‘Mammography ratio’ was the most influential in breast cancer mortality. Municipalities with high breast cancer mortality rates (figure 1) would be those with high values of the variables associated positively with mortality from breast cancer (table 2). Table 3 shows the Pearson correlation coefficients between the covariates associated with breast cancer mortality with low collinearity (VIF<3). The Moran's I of residuals of the final regression model (model II) was −0.011, with p=0.6500; that is, the residuals showed no spatial dependence. The scatter plots representing the residuals versus the covariates that entered into the model are presented in figure 2. These charts, as well as the scatter plots of the residuals versus the covariates that did not enter into the model, indicated no systematic patterns. The sequence of points in straight line which appears at the bottom left of the scatter plot chart of residuals versus predicted values corresponds to the null values of incidence rate. In this study, increased risk of breast cancer mortality was associated, in the municipal level, with the following factors: the mammography ratio, the proportion of women in childbearing age who did not have children (nulliparity) and the proportion of women with private healthcare. There is strong evidence of an inverse association between breast feeding and breast cancer, as shown in the extensive systematic review published by Victora et al. 28 Although a woman can breast feed without getting pregnant, and such practice is stimulated in public programmes in Brazil that promotes induced lactation for adoptive mothers,29 this occurrence is very exceptional. Therefore, we considered nulliparity to be a proxy for non-breastfeeding status in these women, since breastfeeding information was not available in the databases used in this research. The direct association between higher breast cancer mortality and the proportion of women who are users of the private health sector agrees with studies about the topic published in Brazil. Silveira35 analysed the profile of breast cancer incidence and survival, using the population-based cancer registry and the coverage of private health plans in São Paulo, comparing patients with and without health insurance. The outcomes were reported as unexpected, as the longest accumulated survival time was found among patients without health insurance. Overall mean patient survival in the 80 months of study, estimated by Kaplan-Meier, was 75.6% with a median follow-up of 41 months, with survival probabilities of 95% at 12 months and 89.1% at 60 months. Among women covered by health insurance, estimated survival rates were 93.2% in 12 months and 80.6% in 60 months, while the difference between the curves was statistically significant (p<0.001). Studies in the City of São Paulo by both CEINFO36 and Girianelli et al 37 equally reported higher mortality among groups that made use of private sector healthcare facilities. In a manner similar to the present study, a dissertation by Bello38 evaluated the existence of spatial dependence of female breast cancer mortality rate in the State of Rio de Janeiro over a 6-year period and concluded that ‘Average income value of the main work of adults’ and ‘Mammographers index by municipality’ were variables that had a direct association with mortality. Other research carried out in Brazil, which studied factors related to breast cancer such as early diagnosis and survival (but not mortality), indicated that women using the private health sector had an earlier diagnosis and had a higher survival rate (the lifetime from the diagnosis to death) than users of public healthcare. Brito et al 39 showed that women who used the public healthcare system were diagnosed about 10 years later than those who used private healthcare facilities. In a similar vein, Liedke et al 40 observed that women with access to private healthcare were diagnosed with cancer at an earlier stage than those in the public sector. Using the private sector can be considered a proxy of having a higher income, a variable classically associated with higher breast cancer incidence and mortality, which is consistent with the international literature.6 A recent study on the spatial distribution of mortality from breast cancer in the city of São Paulo also revealed that the mortality rates are higher in more privileged groups, with the lowest mortality rates found in the less privileged socioenvironmental grouping, and a decreasing linear trend of rates, the worse the condition of the socioenvironmental grouping of the residence.36 Similarly, Girianelli et al 37 analysed data from all over Brazil and found a strong direct correlation between breast cancer mortality and positive sociodemographic indicators and inversely with the fertility rate. In terms of socioeconomic and racial disparities in breast cancer incidence, in a systematic review, Vainshtein51 concluded that socioeconomic differences are more important than racial disparities. The author suggested that future studies focus on another factor that requires particular attention, which is the disparity between racial and socioeconomic groups regarding the use of oestrogen replacement therapy (ERT), a factor already known as carcinogenic. This study also demonstrated a higher use of ERT in women with better sociodemographic indicators, white ethnicity and private healthcare sector users, which may help to explain these different incidences according to income. In this research, mammography screening did not have a positive effect: instead, it was associated with an increase in breast cancer mortality. The increase in mortality among women screened by mammography can be explained by higher risks linked to both overdiagnosis and overtreatment.43 53 60 The risks of diagnosis include greater exposure to ionising radiation, compression of the breast tissue, increased need for biopsies and the emotional and psychosocial risks of anxiety and depression associated with the process.53 60 A report published in 2016 estimating radiation-induced cancers during screening calculated that, for every 100 000 screened women aged 40–70 years old, 125 additional cancers would be induced by exam radiation, resulting in 16 deaths.61 This is very similar to the data presented by Corrêa et al 62 in Brazil, in the State of Goiás, estimating 16.6 annual radio-induced breast cancer deaths by 100 000 women screened biannually from 40 to 70 years. The increased risks of cardiovascular disease due to cardiac toxicity of anthracycline and trastuzumab treatment and to radiotherapy are well documented.63 The Early Breast Cancer Trialists’ Collaborative Group calculated that, in women treated with radiotherapy, there was an increased relative risk of 1.78 for lung cancer deaths and of 1.27 for myocardial infarction deaths in the treated group, compared with controls.64 Baum60 estimated that, for every 10 000 screened women, for each death averted by mammography, 1–3 additional deaths by heart attack or lung cancer could be expected. Radio-induced cancer can associated to radiation from mammography61 as from radiotherapy,64 and it is possible that attribution of cause of death was biased for women with a prior diagnosis of breast cancer; for example, a woman dying of radiation induced lung or oesophageal cancer might have her condition described as breast cancer in the death certificate. In the ecological study by Harding et al 58 in USA, the regions and rates of screening among more than 16.0 million women were compared, and they observed that the higher the mammography screening rate, the greater the incidence of breast cancer, with no implication on mortality reduction for this cancer. The study even showed a non-significant association between screening and the increase in breast cancer-specific mortality, in line with the results of the present study. Screening and other medical interventions can be provided with the best intentions, but there is evidence that clinicians rarely have accurate expectations of benefits or harms of treatments, screening and tests. The inaccuracies of these expectations regard both benefits and harms, but more often, there tends to be an overestimation of benefits and underestimation of harms.65 Given the need of reliable data to inform public health, transparent surveillance of the real-life harms and benefits of programmes should be a priority in the public health research agenda. Another limitation is the use of an ecological design. Ecological studies are frequently used to explore possible causal relationships and to raise hypotheses, considering, as recommended by Pereira,66 that the results of the geographical comparisons from these studies lead to new investigations in which the unit of observation is the individual. Instituto Nacional de Câncer José Alencar Gomes Da Silva. Estimativa 2014: incidência de câncer no Brasil. Rio de Janeiro, 2014. Observatório de Oncologia. Dados e fatos sobre o câncer de mama 2015. http://observatoriodeoncologia.com.br/dados-e-fatos-sobre-o-cancer-de-mama/ (cited 2016 Jun 8).
. Evolução Da Mortalidade por câncer de mama em Mulheres Jovens: desafios Para Uma política de Atenção Oncológica. Rev Bras Cancerol 2013;59:341–9.
. Risk and protective factors for breast cancer: a systematic review. Cad saúde pública / Ministério da Saúde, Fundação Oswaldo Cruz, Esc Nac Saúde Pública 2011;27:1259–70.
. Risk factors of breast cancer: a systematic review and meta-analysis. Asia-Pacific J Public Heal 2013;25:368–87.
. The ecology of breast cancer: Science & Environmental Health Network, 2013. Ministério da Sáude B. Datasus [Internet]. Informações de Saúde. 2015. http://www.datasus.gov.br/ (cited 2015 Mar 15). IBGE. Instituto Brasileiro de Geografia e Estatística. Geociências - malhas digitais - municípios 2014 - SP [Internet]. 2014. http://downloads.ibge.gov.br/downloads_geociencias.htm (cited 2015 Aug 16). IBGE. Instituto Brasileiro de Geografia e Estatística. Censo 2010 [Internet]. 2010. http://censo2010.ibge.gov.br/ (cited 2015 Jun 1). Brasil E de SP. SEADE - Fundação Sistema Estadual de Análise de Dados [Internet]. 2015. http://www.seade.gov.br/ (cited 2015 Jun 1). Ministério da Sáude B. ANS - Agência Nacional de Saúde Suplementar [Internet]. 2015. http://www.ans.gov.br/ (cited 2015 Aug 16).
. Applied spatial data analysis with R. New York: Second Springer editor, 2013:405. Instituto Nacional de Câncer José Alencar Gomes da Silva. Estimativa 2012: incidênciade câncer no Brasil: Rio de Janeiro, 2011.
. Os benefícios da amamentação para a saúde da mulher. J Pediatr 2004;80:142–6.
. Câncer de mama: perfil demográfico e fatores de risco. R Saúde Públ St Cat 2010;3:21–31.
. Knowledge of and practices regarding risk factors for breast cancer in women aged between 40 and 69 years. Rev Bras Saúde Matern Infant 2011;11:163–71.
. De A. Taxa de mortalidade por neoplasia maligna de mama em mulheres residentes Da Região Carbonífera Catarinense no período de 1980 a 2009. Cad Saúde Coletiva 2013;21:384–90.
. Factores de riesgo de cáncer de mama enmujeres pertenecientes a un consultorio médico del Centro Urbano “José Martí.”. MEDISAN 2013;17:4089–95.
. Amamentação: um híbrido natureza-cultura. J Pediatr 2004;8025:119.
. Secular trends in breastfeeding in Brazil. Rev Saude Publica 2013;47:1–4.
. Aleitamento materno como fator de proteção para o câncer de mama. Rev Rene 2011;12:358–64. Ministério da Sáude B. PNDS 2006: Pesquisa Nacional de Demografia e Saúde da Criança e da Mulher: relatório. Brasília, 2008. CEInfo C de E e I-. Mortalidade por câncer de mama e de colo uterino: estudo da distribuição espacial no município de São Paulo. São Paulo, 2014.
. Análise estatística espacial da mortalidade por câncer de mama feminina no estado do Rio de JaneiroDissertação. Rio de Janeiro: Escola Nacional de Saúde Pública Sergio Arouca, 2010.
. Why cancer screening has never been shown to "save lives"--and what we can do about it. BMJ 2016;352:h6080.
. Difficulties in implementing an organized screening program for breast cancer in Brazil with emphasis on diagnostic methods. Rural Remote Health 2013;13:2321.
. The emperor of all maladies: a biography of cancer. New York: Scribner, 2011.
. Epidemiologia – Teoria e Prática. Rio de Janeiro: Guanabara Koogan, 2002:596.
. Epidemiologia & Saúde. Rio de Janeiro: MEDSI, 1999:600. Contributors Conception and design of study: CSGD, ACGP, MJM, OSB and FCN; acquisition of data: ACGP, MVT, MJM, MMT and PCS; analysis and/or interpretation of data: CSGD, ACGP, AGR, MVT, MJM, MMT, OSB, PCS and FCN; drafting the manuscript: CSGD, ACGP, AGR, OSB and FCN; revising the manuscript critically for important intellectual content: CSGD, ACGP, AGR, MMT, OSB and FCN. All authors approved of the version of the manuscript to be published. Ethics approval The study did not obtain the approval of Ethics Committee because the used data (about the breast cancer mortality and about the covariates) were obtained from public datasets that are open for the access of everyone.